If you own a restaurant that offers outdoor seating, you can spruce it up when it reopens this spring by adding colorful pennant flags! A great way to add color and motion to your setup, the pennant flags from Dori Pole can visually improve almost any location. Especially great in areas that have frequent winds, the pennant flags mounted to Dori Poles give movement and excitement to a normally static environment. You may be wondering how long pennant flags such as ours wouldn’t get in the way, and the answer is with our different size of fiberglass poles. 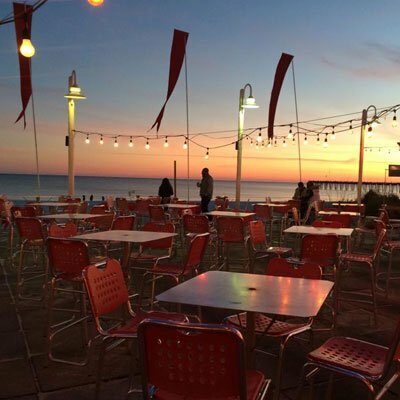 By investing in taller fiberglass poles with Dori Pole, your pennant will fly high enough not to disturb any of your customers or the rest of your outdoor decorations on your restaurant’s patio. Whether you match your restaurant’s branding or pick flags out for specific times of the year, you can express colors that are sure to be noticed by your clientele. We offer single color pennant flags, two-color flags, and can even do special patterns so your flags can match holidays, seasons, or sporting events. If you have a specific color request and are unsure if we are capable of filling the order, give us a call! If your outdoor eating has frequent nuisance birds that try to get stray food from customers eating outside, the Dori Pole pennant flag system functions as a harmless bird deterrent. Effective at keeping birds away, Dori Pole offers a harm-free solution to helping keep the birds at bay. We even offer a bird deterrent kit if you want to make sure you get the right equipment to do the job. With over 30 years of experience providing color and motion to events, festivals, and more, Dori Pole has the attractive, eye-catching implementations you’ve been looking for. Filed under Bird Deterrent, Custom Pennant Flag. Tagged dori pole, pennant, pennant flags.